Though the Western media is barely reporting the fact, the last few weeks have witnessed a total transformation of the Syrian war. Until the liberation of eastern Aleppo in December the Syrian war was being fought mainly in western Syria along a narrow stretch of Syria’s Mediterranean coast in a grinding war of attrition between the Syrian army and various Turkish backed Jihadi groups all of which were led ultimately by Al-Qaeda. The intense pressure of this war obliged the Syrian army to withdraw from most of eastern Syria in order to protect the main centres of Syria’s population and power in the cities along the coast. The resulting vacuum in eastern Syria was filled initially by various Jihadi groups, but ultimately by ISIS, which in 2015 gained essentially undisputed control of this area, save for the isolated city of Deir Ezzor. 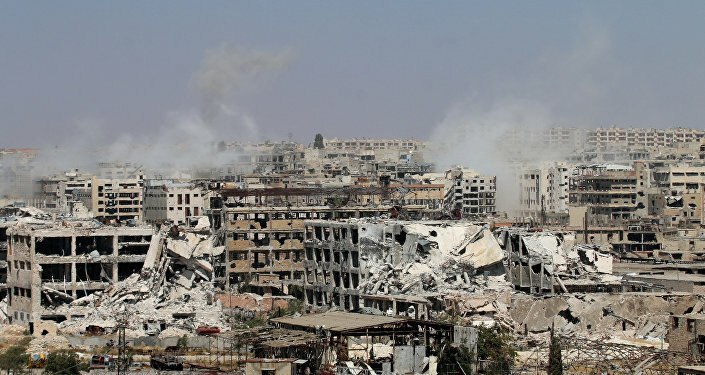 Al-Qaeda’s defeat in December in Aleppo, and the rout of its offensive from Idlib province into Hama province in April, has left the Syrian government in control of all of Syria’s big cities – Damascus, Aleppo, Hama and Homs – whilst Latakia Province and its capital have always been firmly controlled by the government. Though Al-Qaeda still has a presence in some areas in the countryside near Damascus, and is still firmly in control of Idlib Province, these areas are now covered by the agreements reached between Russia and Turkey in December, supplemented by further agreements reached by Russia, Iran and Turkey in May, which set up the so-called ‘de-confliction areas’ in these territories. This combination of Al-Qaeda defeats and peace agreements means that the war of attrition in western Syria is at an end, and that the Syrian army there for the moment at least has won. In saying this it is important to say that fighting between the Syrian army and Al-Qaeda in western Syria has not come entirely to a stop. Bitter fighting still continues between the Syrian army and Al-Qaeda in southern Syria, especially in the bitterly contested town of Dara’a, where the original uprising against the Syrian government started in 2011. Al-Qaeda still from time to time launches several raids on western Aleppo. People everywhere in Syria, including in the safest regions which are most securely under the government’s control, have to face the daily threat of terrorist attacks. Nonetheless the agreements reached between the Turks and the Russians in December, and between the Turks, the Russians and the Iranians in May, have generally held. This has allowed the Syrian army, sections of which have been extensively re-trained and re-equipped by the Russians, to take the battle to ISIS in the east in a serious way, for the first time since the organisation took over central and eastern Syria in 2014 and 2015. Western commentators once claimed that the Syrian army and the Russians were leaving ISIS alone. This was never true, but following the Syrian army’s recent advances into central and eastern Syria this claim has become completely unsustainable. The first fruit of the stabilisation of in the west was the second liberation of Palmyra from ISIS in March 2017. However since then events have quickened at an accelerating rate, with a whirlwind advance by the Syrian army eastward from Aleppo to Rusafa in the north, and an equally dramatic advance in the south, bringing the Syrian army for the first time in years to the Iraqi border. The speed of these advances has no previous precedent in the Syrian war. In 2014-2015 ISIS did accomplish equally rapid advances over comparable distances. However with the Syrian army having withdrawn from eastern Syria these advances were largely unopposed. By contrast the Syrian army’s advances over recent weeks have been sustained even in the face of fanatical resistance from ISIS. This is not the result of some general collapse of ISIS in eastern and central Syria. Whilst the Syrian army has advanced at a blistering rate, US backed Kurdish forces in the north have been making extremely slow progress in their war against ISIS, which is supposed to end with the capture of Raqqa. Compare for example the continued failure of the Kurdish militia to take Raqqa despite having launched their US planned and US backed offensive to capture Raqqa as long ago as November 2016 (“Operation Wrath of Euphrates”) with the latest rapid advances in Raqqa Province of the Syrian army. The Syrian Arab Army (SAA), spearheaded by the elite Tiger Forces, has seized more than 1,400 square kilometers of territory from ISIS in the province of Raqqah. In addition to this, several key oil and gas extraction and refinery sites have been liberated. Lastly, the Syrian Army also expanded their zone of control over the Ethriyah-Raqqah road including two key junctions in the Tabaqah area; this move opens the door to further advances into central Syria from the north by pro-government forces. These whirlwind advances reflect an underlying reality of the Syrian war, which is almost never discussed. The two most powerful military forces in Syria for most of the war (until the coming of the Russians) have been the Syrian army and Al-Qaeda. ISIS and the Kurdish militia are no match for either, and the only reason ISIS managed to expand so rapidly in 2014 and 2015 was because the Syrian army and Al-Qaeda were too busy fighting each other to confront it. Now that the Syrian army does not have to fight Al-Qaeda in its heartlands in western Syria – at least for the moment – it is having little difficulty defeating ISIS wherever it encounters it. These Syrian army advances are transforming the political map of Syria. 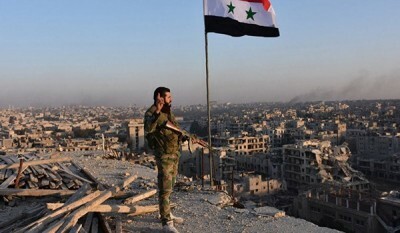 Whereas only a few months ago most Syrian territory had fallen out of the control of the Syrian government, that is rapidly becoming no longer the case. With two powerful columns of Syrian troops now converging on the eastern city of Deir Ezzor – one from Rusafa in the north, the other from Palmyra in the centre – there is now a real prospect that all of central Syria stretching all the way from the Mediterranean to the Iraqi border will soon once more be under the control of the Syrian government. Should that happen the Syrian government’s opponents, far from being credible challengers for power in Syria, will be confined to enclaves in various parts of Syria: a US controlled enclave around the isolated garrison of al-Tanf in the south, a Turkish controlled ‘safe zone’ in the north west, Idlib province in the west, and a large Kurdish area adjoining Turkey in the north east. With the Syrian government in control of most of Syria’s territory and population, it will be increasingly difficult to deny its legitimacy, and should this situation arise then it will soon start to have a serious bearing on the course of the negotiations in Astana and Geneva. The situation in Syria is still not stable. The two Syrian military columns converging on Deir Ezzor have powerful enemies on their flanks: the US in the south and potentially the Kurds in the north. Intervention by either of these would however risk confrontation with Russia, whose Special Forces and advisers are accompanying the columns, and whose air force is providing them with air support. Frankly I don’t think that will happen. A far greater risk is that the unstable peace in western Syria will break down, and that Al-Qaeda will be reactivated, and will try to take advantage of the Syrian army’s advance eastward to capture territory in the west. That would however require the support of Turkey, which has been badly burnt by its involvement in the Syrian war, and which is becoming increasingly concerned by US support for the Kurds in the north. On balance, though any policy which depends on Turkish President Erdogan abiding by the agreements he has signed is fraught with risk, I think self interest in the end will win out, and that the precarious peace in western Syria will hold. If so then the war in Syria may indeed be moving towards its end. President Assad has said repeatedly, even in what were for him his darkest hours, that his intention was to bring all of Syrian territory back under the Syrian government’s control. Once that attracted disbelief and incredulity in the West. Suddenly it does not look so unlikely..
Alexander Mercouris is the editor-in-chief at The Duran.